MONOLITH grill means freedom. This ceramic grill offers a wide range of possibilities – grilling, smoking, baking, barbecuing or roasting. Enjoy all the options it offers, impress your guests and spoil your taste buds. Your garden will become a realm of endless choices. Barbecue, low temperature cooking, baking, smoking... 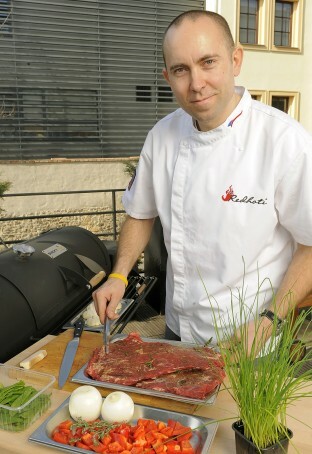 Which ever way you prepare your dishes, the MONOLITH grill will always enable you to achieve perfect results. No matter whether you need very high temperatures to grill the perfect steak or smoke a large amount of meat for hours on low temperatures. MONOLITH grills come in three different sizes and two colours – black and red. “Classic” is the medium-size model with a 46cm diameter rack. “Junior” is a smaller model with the rack diameter of 33cm. 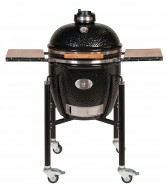 “Le Chef” is the largest model with the rack diameter of 57cm. All three models are fit for professional grilling. You can mount the MONOLITH grill (Classic, Le Chef) into the mobile Buggy table made of stainless ground steel. The grill is fixed in a special spring-loaded holder. 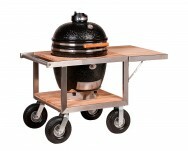 Large wheels ensure smooth and secure transport of the grill even on a rougher ground. With MONOLITH Classic, you can put together a complete and practical outdoor kitchen. MONOLITH grill is mounted in a stainless steel and teakwood buggy which comes complete with a table with a basin and water hose connecter and a top-quality sliding compressor cooler. The unique system of supplying wood chips gives the meat that typical smokey BBQ taste, without having to raise the lid. The wood chips are placed on a rack and are pushed through the intended opening directly in to the fire area.